According to the BC Environmental Management Act, the Code under the Agricultural Waste Control Regulation (section 15) says that a composting site must be located at least 15 meters from any watercourse and at least 30 meters from any source of water for domestic purposes. If piles are not contained, that is they are not on a concrete slab with siding, piles must be 30 meters away from watercourses. LEPS recommends a 30 meter distance in general as sections 3 and 30 of the Code state that agricultural wastes and products must be managed in a manner that prevents pollution. 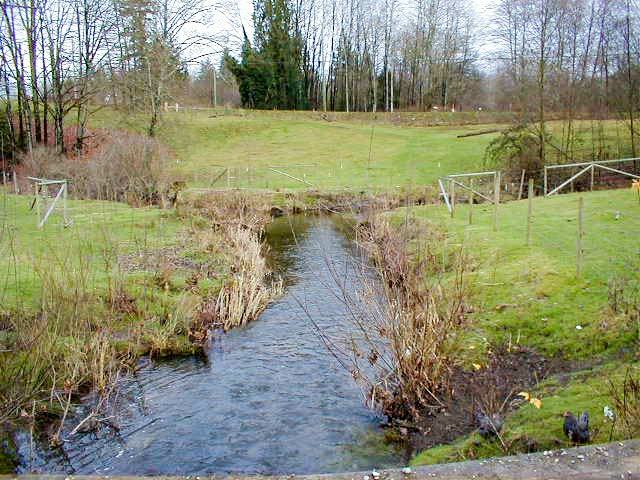 It is important to err on the side of caution as the Federal Fisheries Act (section 34(1)) prohibits the deposit of deleterious substances into watercourses (this could include compost materials and leachate). According to the Drinking Water Protection Act of BC (section 23) a person must not introduce anything or cause or allow anything to be introduced into a domestic water system, a drinking water source, a well recharge zone or an area adjacent to a drinking water source will result or is likely to result in a drinking water health hazard in relation to a domestic water system. In order to avoid this, it is recommended that the distance from wells must be at least 30 meters from any probable source of contamination by the Agricultural Waste Control Regulation (section 15). This includes compost materials and leachate. 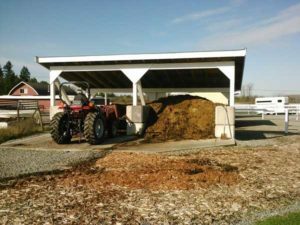 Though a properly composting manure pile should not have much odour there can be some, particularly on hot summer days. Consider locating your site as far as possible from rural residences or residential areas, siting so that prevailing winds transport odours away from rural residences or residential areas. Though the Agricultural Waste Control Regulation Section 19 states that The Code is not intended to prohibit various odours from agricultural operations or activities on a farm, providing such operations or activities do not pollute, a recent Provincial Court judgement found that odours that cause or are capable of causing material physical discomfort to a person are considered emissions that cause pollution. If water is allowed to pass through the compost materials (which it should not), or the system is not on a sloped concrete slab (although it is recommended that it is), ensure that your compost site does not drain directly into a local water course in order to comply with the Fisheries Protection and Pollution Prevention section within the Fisheries Act (section 34). It is important to consider whether you need to be able to access the system all year, particularly during wet weather. You must also consider access to the site for building the system itself. If you are having a concrete pad and forms poured you want cement trucks to be able to access the site as closely as possible. You need to consider whether you intend to manage the system by hand or with a tractor. Will the system handle the size of machinery you are currently using? Are you intending to get larger equipment in the future? If you sell your property, what sized equipment might a new landowner be using? Consider how close you want your system to your barn. Do you want your stall cleaners to dump directly into the system or will you have a temporary dump site and move it mechanically into the system later? You may also want to consider the proximity to the horses as insects from the system may bother horses. Consider how close you want your system to be to your fields where you will be using the compost. How far do you want to run your machinery? Greater distances to fields means more wear and tear on your property and more of your time going back and forth. 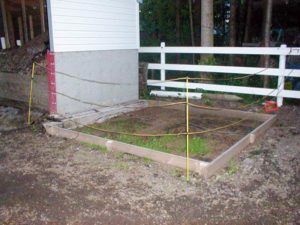 Consider how much space you will need to work with and around your compost system. You will need enough room to get your tractor in and out of the system, for your tractor to turn around, and for you to park your manure spreader to load it. Consider how much space you have surrounding the system. Do you think you might expand the system in the future if you take more animals on your property, or if your animals generate more waste than you planned for? If you do not build a cover for the system immediately, do you hope to build a roof in the future?